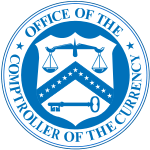 The Office of the Comptroller of the Currency (OCC) is an independent bureau within the United States Department of the Treasury that was established by the National Currency Act of 1863 and serves to charter, regulate, and supervise all national banks and thrift institutions and the federal branches and agencies of foreign banks in the United States. The Comptroller of the Currency is Thomas J. Curry. Headquartered in Washington, D.C., it has four district offices located in New York City, Chicago, Dallas and Denver. It has an additional 48 field offices throughout the United States, and a London office to supervise the international activities of national banks. 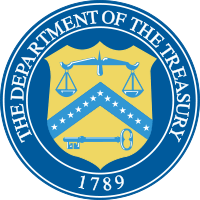 It is an independent bureau of the United States Department of the Treasury and is headed by the Comptroller of the Currency, appointed to a five-year term by the President with the consent of the Senate. is the agency responsible for investigating and prosecuting acts of misconduct committed by institution-affiliated parties of national banks, including officers, directors, employees, agents and independent contractors (including appraisers, attorneys and accountants). The OCC participates in interagency activities in order to maintain the integrity of the national banking system. By monitoring capital, asset quality, management, earnings, liquidity, sensitivity to market risk, information technology, consumer compliance, and community reinvestment, the OCC is able to determine whether or not the bank is operating safely and soundly, and meeting all regulatory requirements. The OCC was created by Abraham Lincoln to fund the American Civil War but was later transformed into a regulatory agency to instill confidence in the national banking system and protect consumers from misleading business practices. The OCC regulates and supervises about 2,000 national banks and federal savings associations and 50 federal branches of foreign banks in the U.S., accounting for over three-quarters of the total assets of all U.S. commercial banks (as of 2012). Other regulatory agencies like the OCC include: the Federal Deposit Insurance Corporation (of which the Comptroller serves as a director), the Federal Reserve, and the National Credit Union Administration. The OCC routinely interacts and cooperates with other government agencies, including the Consumer Financial Protection Bureau, Financial Crimes Enforcement Network, the Office of Foreign Asset Control, the Federal Bureau of Investigation, the Department of Justice, and the Department of Homeland Security. The Comptroller also serves as a director of the Neighborhood Reinvestment Corporation, and the Federal Deposit Insurance Corporation. ... State regulators cannot interfere with the business of banking by subjecting national banks or their OCC-licensed operating subsidiaries to multiple audits and surveillance under rival oversight regimes. In Cuomo v. Clearing House Association, L. L. C. 557 U.S. 519 (2009), the Court clarified its decision in Watters, stating that federal banking regulations did not preempt the ability of states to enforce their own fair-lending laws, as "'general supervision and control' and 'oversight' are worlds apart from law enforcement," and therefore states retain law enforcement powers but have restricted "visitory" powers over national banks. In October 2014, the OCC released a bulletin, "Risk Management Guidance" mandating that banks assess and manage the risk of all their third-party relationships. The bulletin states that a bank's use of third parties does not diminish its responsibility to ensure that all activities are in compliance with applicable laws. Previously, banks may have only monitored third party relationships which posed the greatest risk to them. Under the new guidelines banks must monitor all third-party relationships by adopting risk management processes "commensurate with the level of risk and complexity of its third-party relationships". The document stresses the importance of an effective risk-management process throughout the entire life-cycle of the relationship. This includes: due diligence in third party selection, written contracts, ongoing monitoring of third party performance and activity, contract termination ability, clear risk management roles, documenting and reporting, and independent reviews. Banks often engage tens-of-thousands of third parties and are unable to effectively manage the associated risk of all their relationships through traditional means (spreadsheets). As a result, many banks have adopted external IT solutions to assist their needs. This has rapidly expanded the market for third-party management software solutions. In July 2007, the OCC launched HelpWithMyBank.gov to assist customers of national banks and provide answers to national banking questions. ↑ "OCC: Thomas J. Curry Takes Office as the 30th Comptroller of the Currency". Occ.gov. 2012-03-29. Retrieved 2013-11-11. ↑ "Thomas J. Curry : Comptroller of the Currency" (PDF). Occ.treas.gov. Retrieved 2013-11-11. ↑ "Office of the Comptroller of the Currency Annual Report : Fiscal Year 2012" (PDF). Occ.gov. Retrieved 2013-11-11. ↑ "Proposed Rules : Federal REgister Vol 68 No. 150" (PDF). Edocket.access.gpo.gov. Retrieved 2013-11-11. ↑ Archived October 15, 2008, at the Wayback Machine. ↑ Watters v. Wachovia Bank, N.A. , 550 U.S. 1 (Supreme Court of the United States 2007). ↑ "Help and Frequently Asked Questions about National Banks from OCC's". Helpwithmybank.gov. Retrieved 2013-11-11.